Developer Quote: "Now you can make realistic embroidery on your iPhone or iPad with Cross Stitch Maker: Draw realistic embroidery for free eCards and more! Create beautiful pictures fast by typing a message and using the built-in library of borders and clipart." Your iPhone and iPad are electronic, state of the art, techno gadgets. If you are an artsy sort of person, how do you blend both worlds showcasing your talents using the latest technology? 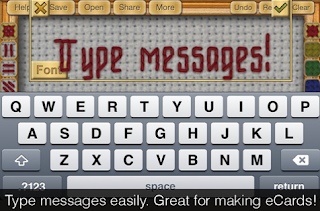 Well, Cross Stitch Maker: Draw realistic embroidery for free eCards and more! 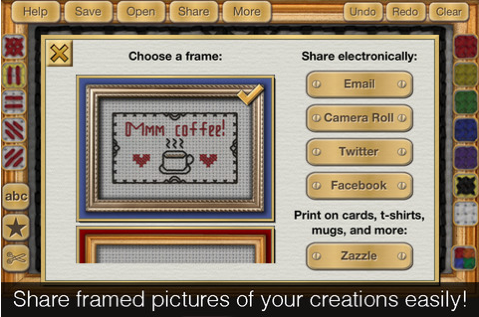 is an innovative and unique tool to get you creating amazing cross-stitch artwork on your device. - Make pixel art inspired by your favorite video game. When you open Cross Stitch Maker you'll see a realistic embroidery cloth. Select the stitch you prefer from the left and the color thread you prefer on the right. (Additional colors are available through the multi-colored thread box on the bottom of the display.) Move your finger along the background to create a unique cross stitch design. Looking to make a special greeting card? Cross Stitch Maker will do a fine job of placing your message in a colorful, realistic cross-stitch setting with frame. 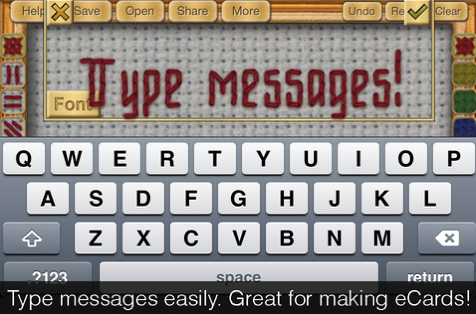 Just tap the abc font button to type your message in cross-stitch and share. Now if you want a pre-made frame or design, tap the star button for a terrific selection for those of us who are not quite so creative! That's how easy, colorful and creative this "stitching" app is for everyone in the family! COOL CONCLUSION: Cross Stitch Maker is a fun, creative way to prepare ecards, a future cross-stitch project and other artwork when you feel like being unique!